As the World Cup approaches, South Africa& #39;s soccer grannies are working to fulfil their own dream -- competing for glory in America. 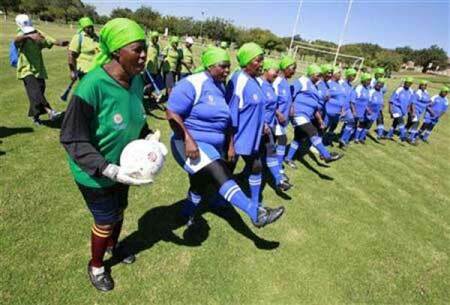 The 35 women, aged from 50 to 84, play for a team called Vakhegula Vakhegula or Grannies, Grannies in the Xitsonga language of northern South Africa. The team was founded by community worker Beka Ntsanwisi five years ago to help the older women keep fit and flexible, but the project has been so successful they have set their sights on a trip to the Veterans Cup competition in Lancaster, Michigan. "We have been invited to play in America from July 13-18 for the Veterans Cup, where the grannies come together and play soccer. Not only grannies but everybody who is old. So my problem now, the challenge that I have, is that I do not have enough money," Ntsanwisi said. The team hail from a rural township near Tzaneen, 600 km (373 miles) north of Johannesburg. They came to South Africa& #39;s business capital last weekend to play in a tournament to raise money for their trip to America. They played with credit, egged on by cheering crowds, before going down 3-1 to the Metro Rail Eagles, whose players are mostly in their 30s. But the grannies are undaunted. Ntsanwisi said they had raised 130,000 rand (11,620 pound) so far but need 500,000 rand to make the trip to America for a tournament that starts two days after the end of the month-long World Cup, first to be held in Africa. Whatever happens, however, the grannies have no regrets, saying playing football, often in their aprons after domestic work, has changed their lives. Onica Ndzovela, 77, suffered back pain and sore knees before joining the team three years ago. "I am fresh, I don& #39;t feel any pain in my body, I can run. At home I do all the housework by myself. I paint the walls and fit tiles," said defender Ndzovela.